Q. What does Professor String recommend for guitar or bass strings? 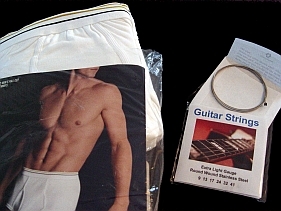 Similar to strings, a brand new package of underwear contains more than one. Strings are bought by gauge size. Underwear is bought by waist size. Strings are bought by type, round wound, semi-round, or flat wound. Underwear is bought by type, boxers, briefs, or bikini. Strings are bought by material, stainless or nickel. Underwear is bought by material, cotton or silk. Perhaps the biggest similarity to underwear is this...When you are wearing your underwear, few people can tell what brand you are wearing. When you have strings on your guitar, few people can tell what brand you are using. The recommendation is this: If you want the most from your musical instruments, then detail, knowledge, and education will play a vital role. You must find what will work best for YOU. Do your homework. Do not fall for the marketing hype, paid endorsements, and "sponsored" string tests. Be your own endorsement. Try new things, and try them often.